"Project Runway" on Bravo features host supermodel Heidi Klum and a panel of industry luminaries, including judges Michael Kors, top women's and men's wear designer and Nina Garcia, Elle magazine fashion director, as they decide who is “in” and who is “out.” Project Runway provides budding designers with an opportunity to launch their careers in fashion. 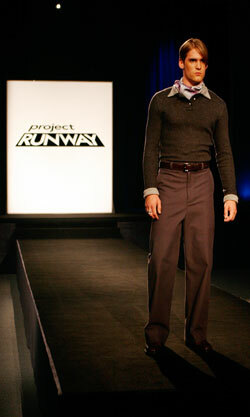 You can be the owner of the original Project Runway designs seen on tv! Buy them at their auction, prices seem to end up ranging from $100 to $500. These are the exact designs from the Project Runway show tailored to fit the model, sized 0 - 2 and anywhere from 5'10" to 6'2". Item ships within 5-7 business days via USPS after auction checkout.